Origin and Habitat: Mantaro Valley (central regions of Apurímac, Ayacucho and Huancavelica), southern Peru. The individuals in the southern extreme of the range (Valle de Cotahuasi) are morphologically different and may belong to another species (Browningia viridis), which is currently considered a synonym. Altitude: 1000-3000 metres above sea level. Habitat and Ecology: Browningia hertlingiana occurs on slopes of inter-Andean valleys in dry Andean forests. It is abundant and has a relatively wide range. 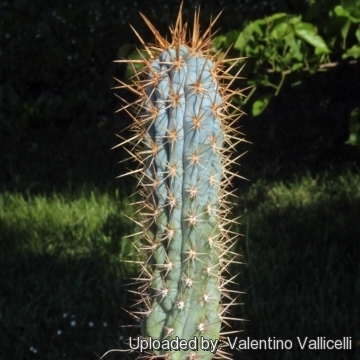 Agricultural activities are expanding in the range of this cactus and leading to a population reduction. The subpopulations on steep slopes are safe from this impact, as agriculture is not feasible there. Although some reduction in the population size has been observed, this impact is not considered significant enough to justify a classification in a threatened category or as Near Threatened. Kakteen (H. Krainz) Lief. 31 & 32, Gen. C iv/I. (Nov. 1965), in obs. Browningia hertlingiana var. nobilis hort. 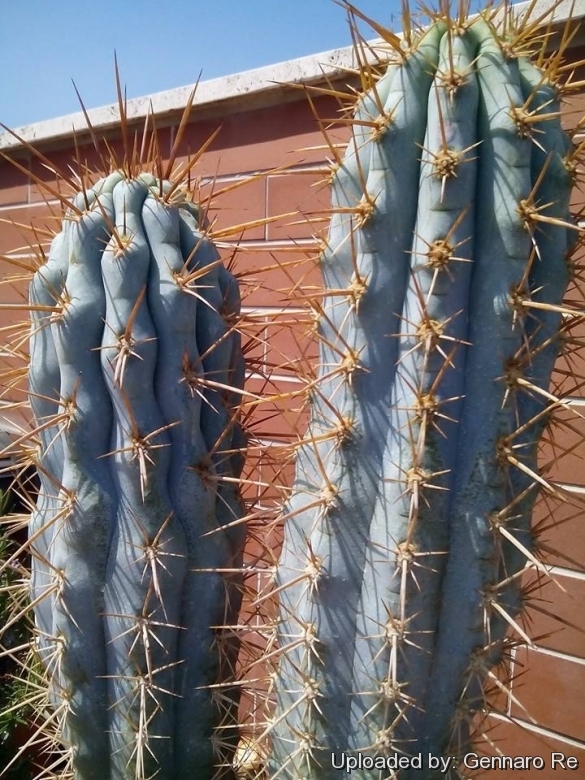 Description: Browningia hertlingiana also known as the “Blue Cereus” is a huge columnar cactus sought after by collectors because the juvenile specimens have a beautiful blue frosty covering. 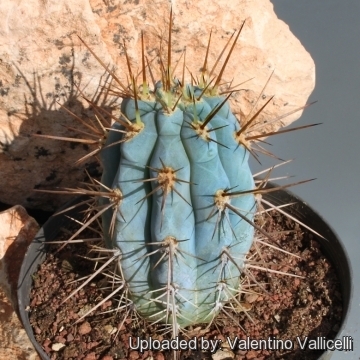 It one of the few really blue cacti. Habit: It is a perennial treelike, stem succulent, with columnar few branched stems that, under favourable conditions, can reach the ultimate height of 8 m and spread of 4 m.
Stem: Trunk undivided about 1 m tall from which several stems arise, main and side stems usually unbranched (or very few benched above ), erect up 30 cm in diameter, the new growth is a fantastic vivid turquoise blue while old growth turns a pale olive green. The typical blue covering only develops in a warm climate and with much light. Ribs: Up to 18 (or more) cm long, tuberculate. Areoles: Somewhat sunken on tubercles tips. Spines: Dimorphic with two distinct young and mature forms. Spines of juvenile stems: About 5-8 unequal poorly differentiated (of which centrals 1-3, radials 4-6), the longest to 8 cm long, all yellow or yellowish grey and tipped brown. Spines in the upper part of flowering stems: Up to 30 more or less equal, more flexible, bristle-like, yellowish. Flower: Nocturnal, white up to 5 cm in diameter: Tube curved, dark purplish brown, with imbricate ciliate scales. Buds, outer perianth segments, pericarpel and tube scales very dark maroon/purple to almost black. Blooming season: Flowers appear in summer, only on plants over 1 m tall. Fruits: Dry, 2,5 cm in diameter. 10) Ostalaza, C., Cáceres, F. & Roque, J. 2013. Browningia hertlingiana. In: IUCN 2013. "IUCN Red List of Threatened Species." Version 2013.2. <www.iucnredlist.org>. Downloaded on 25 April 2014. Cultivation and Propagation: Browningia hertlingianais a much decorative relatively frost hardy summer grower species. Still with it's blue colour and gold spines the plant is stunning even out of flower. Growth rate: The plant supposedly grows pretty slow. Repotting: Repot in the spring, when their roots become cramped. Generally, they should be repotted every other year in order to provide fresh soil. After repotting, do not water for a week or more. Use pot with good drainage. Fertilization: It grows much faster with a low nitrogen content fertilizer in spring and summer. Watering: Water regularly from March till October, the thin, fibrous roots suffer if there is humidity, therefore the plant should be watered only when the surrounding terrain is dry. Keep dry as soon as the temperature starts dropping in October and keep it perfectly dry in winter at temperatures from 5 to 15 degrees centigrade. Preferable not to water on overcast days, humid days or cold winter days. 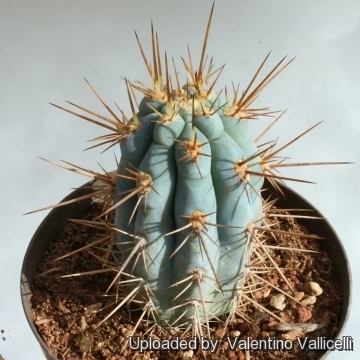 Hardiness: They need to be kept in a cool place during winter rest and are somewhat resistant to frost if kept on the dry side prior to, and during, cold weather with little danger of being killed (unlike most of the Pilosocereus species). They are hardy to -5 C ° C or less, for short periods. However in cultivation it is better not to expose it to temperatures lower than 5° C, even if in an aerated and protected location. Although it is one of the easier Browningia to grow, it tends to rot in winter during the resting phase, if kept wet. In the rest period no high atmospheric humidity!! Outdoors this plant is very adaptable, as long as you avoid excessive humidity in the winter months. Sun Exposure: Exposure: It need full sun exposures with ample airflow for best appearance. Maintenance: Older plants often need to be supported as they tend to collapse under their own weight. Use: Excellent as landscape or patio plant. 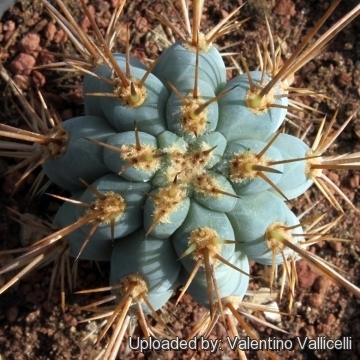 It is suitable for “desert” gardens, in association with other xerophytes. Where the open air cultivation is not possible due to the climate, it is to be cultivated in pot in order to shelter it in winter. Propagation: Almost exclusively by seed as the branches cannot be used for cuttings or for grafting. The seeds can be sown in pots of fine, well-drained sandy soil, any time during the spring when temperatures are warm. The seedlings should not be disturbed until they are well rooted after which they can be planted separately in small pots.